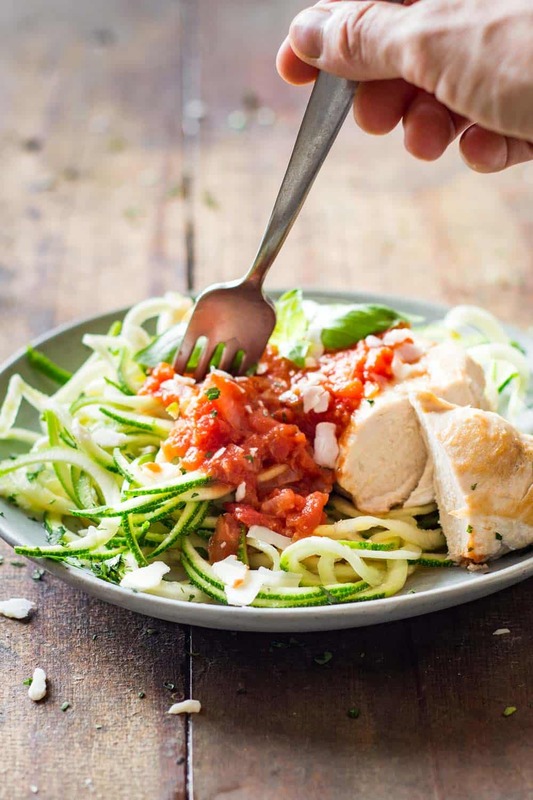 Zucchini Noodles (=Zoodles) are the base of this Easy Chicken Zoodles recipe and convert it into a naturally gluten free dish full of vegetable power. The great thing about zoodles is that a hot sauce spooned on top is more than enough to soften up the noodles. No need to cook them. My sister gave me a handheld spiralizer for Christmas and I was super excited to use it but quickly noticed it takes forever to spiralize vegetables with it. I’ve used it to spiralize vegetables mostly for decoration purposes but not too many because it takes so long. 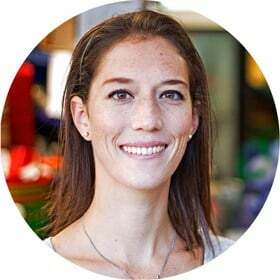 When she sent me a picture with zucchini noodles as inspiration for my blog I told I her I couldn’t make it with the hand held spiralizer but that eventually I was going to buy a spiralizer for these kinds of recipes. A week later the post man knocks on my door and hands me over the most amazing spiralizer I have ever seen. Huh?!? I didn’t order that! My sister did of course! Isn’t she amazing? 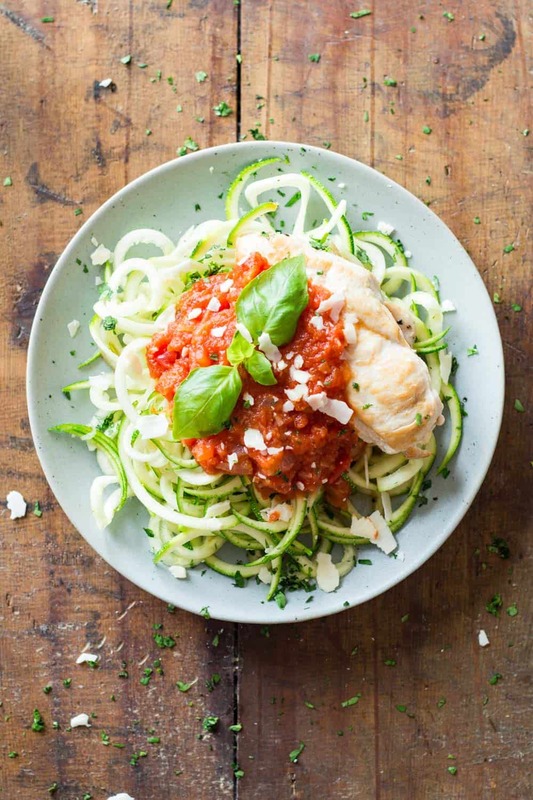 You can thank her for this amazing Easy Chicken Zoodles recipe and many more spiralized veggies recipes to come. Now, the most important part about this recipe is the Roasted Garlic Tomato Sauce. You will have to make that ahead and consider the time for making it. I had a batch in the freezer because as I suggested in that recipe post you should make the recipe times 2 or 3 and freeze batches for later uses. The sauce has such an amazing flavor it turns every dish into a fancy dish. Sometimes I feel like roasted garlic should be an official requirement for every good sauce, haha. 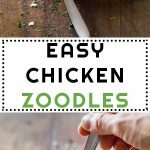 This Easy Chicken Zoodles is easy to make because the chicken is made in 20 minutes without much work. 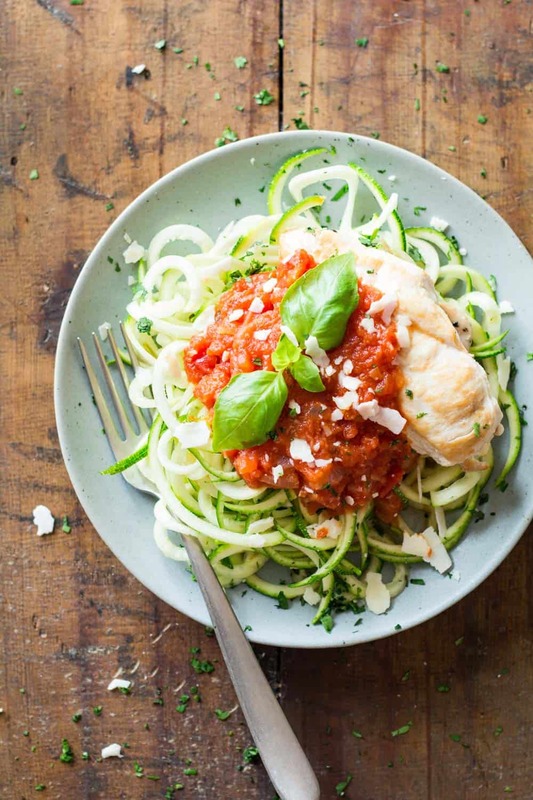 In the meantime you can, reheat the sauce, wash and spiralize the zucchini and wash the spiralizer and store back in the cupboard. I love recipes that have enough passive time to even clean up the kitchen before. Sitting down to have a meal knowing there will be only little dishes to clean up afterwards feels GREAT! Tell me I’m not the only one. I love the simplicity about this dish. No complicated steps, no big mess in the kitchen. The easy in Easy Chicken Zoodles recipe title was absolutely necessary. There are no better word to describe the recipe. Even if you don’t have a frozen or refrigerated batch of Roasted Garlic Tomato Sauce in the fridge/freezer. Consider some extra time (mostly passive time) for it, it will be equally easy to prepare though. I cannot believe I was able to post 3 recipes plus a recipe video on Facebook this week. It is absolutely INSANE to work from home with children present. OMG! My kids have been really, really patient with me but their patience wears off after many hours of not playing with them of course. It is totally understandable. The good thing about these past two weeks: I felt so bad for working so much I organized cool trips for the afternoons. I took them to Mont Royal to play in a beautiful tiny waterfall. We went to the most amazing splash pad in Montreal. Saw many friends every other day at the pool. Had delicious ice cream too many times in a row. Zucchini Noodles (a.k.a. 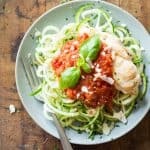 Zoodles) are the base of this Easy Chicken Zoodles recipe and convert it into a naturally gluten free dish full of vegetable power. Heat a large skillet (that has a lid) over medium heat. Once skillet is hot add olive oil, wait a minute for it to heat up and then add the chicken breasts. Sear chicken breasts for 1 minute one side and 1 minute the other side. Put the lid on the skillet and reduce heat to low. Set a timer for 10 minutes. In the meantime, bring Roasted Garlic Tomato sauce to the boil in a saucepan over low heat. Wash, dry and spiralize 4 zucchinis (one for each person) and arrange on 4 plates. Once chicken alarm goes off, remove pan from heat source WITHOUT UNCOVERING! Set an alarm for another 10 minutes. Do not lift the lid. NO peaking. Once chicken alarm goes off for the second time, remove lid, take out the chicken breasts and place one on each plate on top of the zoodles. Finish off by spooning abundant Roasted Garlic Tomato Sauce on all of it. Sprinkle with chopped basil and shaved or grated Parmesan cheese. Enjoy! Love this idea right now bc it’s so hot here. The thought of boiling pasta makes me sweat! Lovely! I love quick and yummy recipes. I was curious about the brand of spiralizer you used. Was it easy to use & clean? Currently, I use my peeler to make Ribbons but I think a spiralizer would be a good item to have on my Christmas list. Thank you for the recipe! Hi Christina, this is the one my sister got me https://www.amazon.com/Veggetti-Table-Top-Spiralizer-Quickly-Vegetables/dp/B00VQTHRAA/ref=sr_1_1?ie=UTF8&qid=1471063913&sr=8-1&keywords=vegetti+pro and it works PERECT! I love it! You can choose to make the thin but broad noodles, thick round noodles or thin round noodles. It was really easy to use. I love easy, fresh, clean recipes! Esp when your busy! It’s great that your kids have been patient with you and that you got so much done this week! Have a great weekend.